The reality is daunting: in 2016, we are witnessing a real struggle to adequately feed our global population of 7 billion people. The question is even more demanding: how are we going to adequately feed 9 billion people by the year 2050? 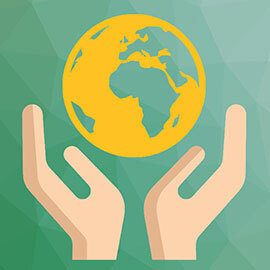 Laurier students are invited to contribute to solving this local, regional, and global problem at the Feeding 9 Billion Challenge — a 24-hour event taking place at universities across Canada. Organized by the Laurier Sustainability Office, in partnership with Social Innovation & Venture Creation (SIVC) Laurier, the Feeding 9 Billion Challenge is offering up to 60 Laurier students a unique opportunity to address food security issues. Registration to participate is available online. Those 60 students — drawn from all Laurier faculties — will be spending 24 hours, from 4 p.m. on October 21 to 4 p.m. on October 22, to explore flaws and solutions to our current food systems. They will be in the Hawks Nest, located in the Fred Nichols Campus Centre on Laurier's Waterloo campus. Students will split themselves into teams and be tasked with creating innovative solutions to the issue of food security at local, regional and global levels. Faculty members, staff associates and community experts on food security issues and sustainable food practices will support students throughout the challenge. At the event's culmination, teams will pitch their ideas to a panel of judges, and the most innovative and sustainable solutions will be awarded prize money. After the event, there will be opportunities for students to take the ideas they come up with and develop them further, thus giving students and their ideas a chance to change our own communities for the better. Dinner, breakfast, and lunch will be provided to all participants, who also have the option to stay overnight at the event.